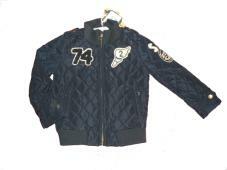 Quilted, padded jacket in navy with patch details and zip pockets. 100% Polyester body, Lining 55% Nylon 45% polyester. Padding 100% Polyester.